Unlike U Thiri from Yangon Myanmar my hobby is not cars and watches, instead it is cameras and high heels. However, in the grand scheme of things, these seemingly very different goods are really not so different at all. When it comes to the things we like, the things that interest us, or the things that make up our hobbies, we become fascinated with our options. We want the best watch, the best car or the best shoes. Living in the United States we have grown accustomed to the luxury of having access to those premium goods. For consumers like U Thiri, this was not the case until just this march. 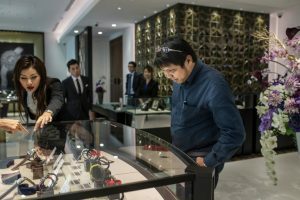 This march the company Franck Muller opened up Myanmar’s firsts luxury watch store. According to the International New York Times article “A Land Eager to Look Rich: Luxury Brands Edge Into Myanmar” by Mike Ives, Myanmar’s economic growth has been stunted since their military coup in 1962. It has only been since the 2012 elections in Myanmar that foreign investment has been allowed. In the years following the election investment has really taken off. By 2015 the countries economy was growing by 7% annually as opposed to 5.6% in 2011. Interestingly, most of this growth has been centered around the middle and lower classes. While the economy has been developing like crazy in almost all sectors, luxury is one of the last to come in. This is because of the nature of the investment and a lack of historic wealth in Myanmar’s consumer base. That said, Myanmar is rich with resources and is finally ready to let its economy grow explosively. According the this article, luxury goods are Myanmar’s next stop on the train to globalizing their economy. This is important to think about because as global consumers, when we see the fact that you can find a Starbucks or McDonalds virtually everywhere you could want to, we assume that other products that are offered to us are the same way. We take for granted how large our local economy is when compared on a global scale.